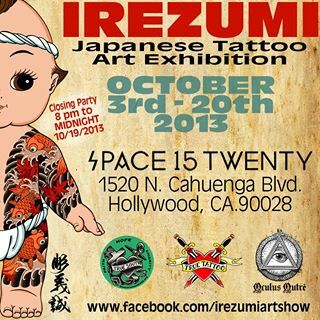 Check out the IREZUMI art show at Space 15 Twenty in Hollywood, CA. The show is up until October 20th. IREZUMI is a group art show featuring original Japanese Tattoo art works from around the world. Artists include: HORIYOSHI 3, BOB ROBERTS, HIROSHI HIRAKAWA, MUTSUO NAKABAYASHI, GANJI, NAMI CHANG, MIKE ROPER, MIYAZO, BRIAN KANEKO, SMALL PAUL & more!